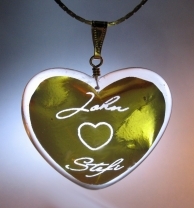 Resin, mounted on 18" gold-plated chain. Resin, mounted on 18" silver-plated chain. Ahhh…romance. We strive to keep it alive and long for more of it in our lives. Every woman would agree with me that romantic gestures are the best way to let her know you love her deeply. 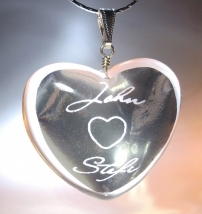 What better way to show your beloved how much you adore her by offering a truly personal gift. 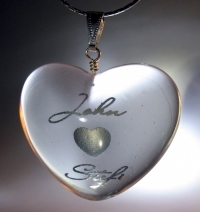 These customized hearts are made individually, hand cast with your name and hers embedded inside each generous heart. Chose either first name version or chose your initials and hers just like in high school. Crafted in Luxane™, a state-of-the-art polyurethane resin, each pendant is a unique work of art. No two are identical. Learn more about Luxane. Each pendant is completely hand-cast from a custom mold in my workshop, lovingly finished, and polished to perfection. Measurements: 1.6"W x 1.6"L x 0.6"T mounted on a 18" silver-plated or gold-plated chain. .
Packaged in a classic felt pouch. 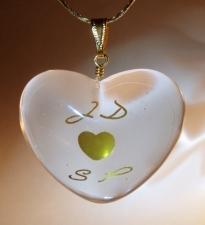 Each pendant is made individually; please allow 5 business days for shipment. Shipping within USA is via First Class Mail with confirmation receipt at $3.95. Shipping available to many countries outside the USA. Please email me for shipping costs and details before placing order.